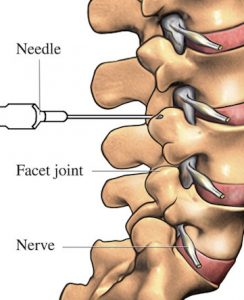 What are the different types of nerve block injections? Although each of these procedures is designed and intended to relieve pain in a specific area pertaining to the nerve being treated, they are all very similar in application. The procedures are all performed very similarly. The basic procedure is that the patient usually lays face down on a procedure table, although sometimes for cervical injections they may be seated in a special chair in a forward reclining position. A pain management doctor typically performs the injection using some sort of image guidance (ultrasound or fluoroscopy), to ensure the most accurate placement. Trigeminal nerve blocks- the trigeminal nerve supplies the head and face, blocks to this nerve are intended to relieve patients who suffer from myofacial pain and pain in their scalp. Supraorbital nerve block– this nerve is treated to relieve pain of the forehead above the eyebrows and the scalp. This procedure is also used to numb the face for medical procedures where numbing by tissue infiltration (local injections) are not appropriate due to tissue distortion. Often plastic surgeons will use a supraorbital nerve block to numb the area around the eyes to prepare them for a surgical procedure. Maxillary nerve block- a procedure for relieving myofacial pain, also used for some dental procedures when an abscess prevents local anesthetic from being used. Sphenopalatine nerve block- this is a procedure for treating acute chronic myofacial pain and head pain, frequently used for patients suffering cluster headaches. 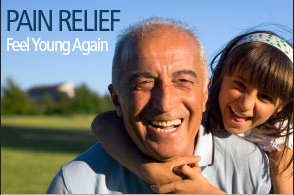 The procedure is also used to relieve pain for patients with certain types of head and neck cancer. 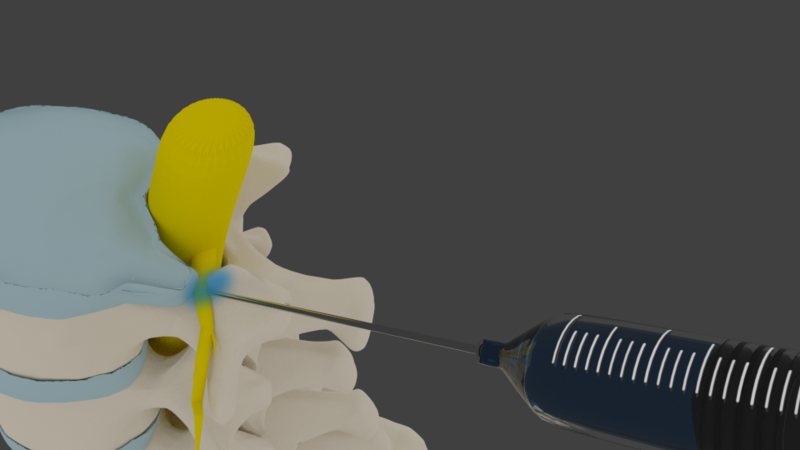 Cervical epidural, thoracic epidural and lumbar epidural blocks– these procedures are most frequently used for patients suffering back and pain from DDD (degenerative disc disease), spinal stenosis, radiculopathy and sciatica from pinched nerves. Celiac plexus block- this procedure is intended to relieve abdominal pain. 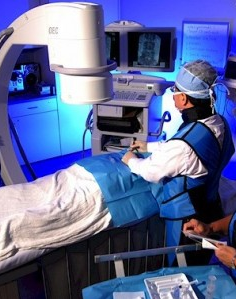 Often patients with certain types of cancer benefit from these injections. Sympathetic nerve block– this procedure is used to help relieve pain for patients suffering from CRP (complex regional pain syndrome), Raynaud’s syndrome, and certain types of chronic abdominal pain. Stellate ganglion block– this procedure is also used for treating patients suffering from CRP, Raynaud’s syndrome, and also relieves or reduces hot flashes by menopausal women and breast cancer survivors. 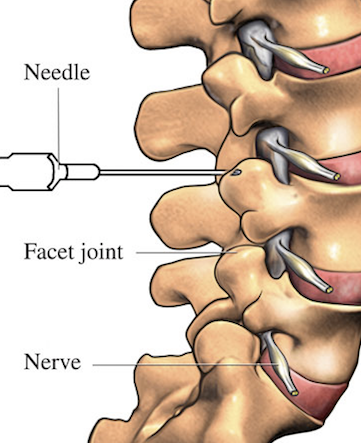 Facet joint block– a facet joint block, or facet joint injection, is a procedure where a mixture of a local anesthetic and corticosteroid is injected into the area between the vertebrae intending to numb the nerve root in order to relieve the patient of chronic back pain associated with the nerve treated. The area to be injected is first cleansed with a antiseptic solution to minimize the risk of infection. The area to be injected is then numbed with a topical anesthetic and then a needle is inserted under fluoroscope guidance. A fluoroscope is a type of x-ray machine that allows the doctor to see the insertion and placement of the needle in real time. Once the needle is in place a contrast dye is first injected to ensure the medications will go to the desired location. Once this has been confirmed a mixture of local anesthetic and corticosteroid is injected into the area. The patient may feel a sensation of pressure at first, and then the local anesthetic will usually numb the nerve and bring relief that will last for several hours. It usually takes a day or two for the steroid to take effect, but when it does it usually lasts for several days to several weeks. It typically requires several injections to gain the maximum benefit of the steroid after which the benefit can be felt for as long as several months to a year.